There are currently no events. Check back. December 2018 • AGM Coming January 15, 2019 • Mark the date. RSF will hold its Annual General Meeting on January 15th 19h00. December 2018 • ​ 'Tis the season of giving! 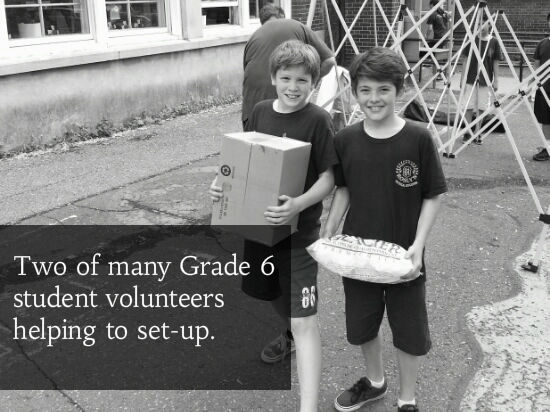 • Like most public schools, Roslyn School depends on the generosity of friends and families to support classroom initiatives. 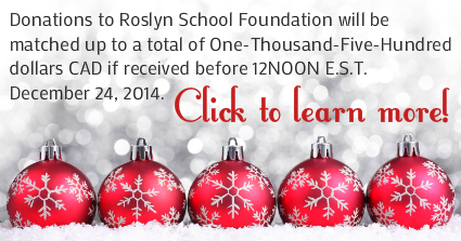 Did you know, donations to Roslyn School Foundation qualify for a tax receipt for 2018 if made prior to December 31, 2018. 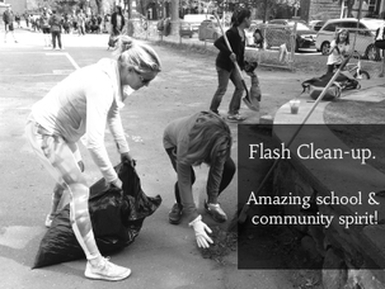 Your contribution has the power to fundamentally enrich the lives Roslyn School students. To each donor, we send our thanks. If you have not yet made a gift to our foundation, we ask that you consider joining our donors by making a gift today. DONATE NOW and be re-directed to our online donations page at CanadaHelps.org (you will be issued a tax receipt immediately for online donations). ​July 2018 • Crowned Little League Provincial Champions • Three Roslyn School students help the NDG Minor Baseball Minor Division Lynx capture the 2018 Provincial title in Rouyn-Noranda. Students Alex Buckles, Jayden Perlman and Patrick Sweeney helped NDG capture a third consecutive Championship. Read more. NOVEMBER 2016 • ANNUAL GENERAL MEETING • Everyone is welcome to join our AGM on Wednesday November 30th at 19h00 in the Roslyn School staff room. A new Board of Directors will be elected and new officers of the Foundation will be appointed. Interested in fundraising for Roslyn School? Join us! NOVEMBER 2016 • PRESIDENT'S MESSAGE FALL 2016 • Sincere Thanks to our volunteer Board of Directors and Honorary Members who have supported the Foundation's fundraising initiatives. READ MORE. NOVEMBER 2016 • ROSLYN ALUMNI LEONARD COHEN PASSES AWAY • Roslyn School community, Montrealers, music and poetry lovers around the world mourn the passing of Leonard Cohen, perhaps Roslyn School's most famous alumni. 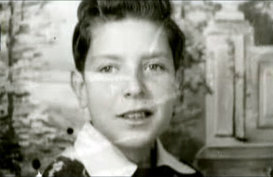 Left is an un-credited and undated photo of elementary school aged Cohen. SEPTEMBER 2016 • SCHOOL YARD IMPROVEMENTS • Over the Summer major improvements to the school yard were implemented. There are more finishing touches to be completed. When you have a chance, pass by and see the fresh new look of Roslyn School's yard. MARCH 2016 • GRADE 2 CLASS GETS OVER $1,200 IN DONATIONS • Families of Roslyn School Grade 2 classroom 215 rallied to create a better learning environment for current and future students. Over $1,000 was donated towards new materials and over $200 in materials was gifted to the class by 2015-16 students and their families. Read the Open Letter from teacher Géraldine Gras. DECEMBER 2016 • AGM CONCLUDED, NEW BOARD ELECTED • With the 2016 AGM completed, the Foundation welcomes two new Directors and Curtis Page as the President. Miriam Roy-Deamude and Robert Vanier join Mr. Page as new members while Jennifer Timmons, Paul Tsang and founding member Leah Trineer return for another year. DECEMBER 2015 • 2015 ANNUAL HOLIDAY GIVING CAMPAIGN LAUNCHED • The Foundation announces its 2015 Annual Holiday Donor Challenge Campaign. A Donor has come forward to challenge Roslyn families, friends and community by offering to match their donations up to $6,500CAD towards a school yard improvement grant application valued at up to $75,000.00. Read how your donation this holiday can be DOUBLED, then TRIPLED! 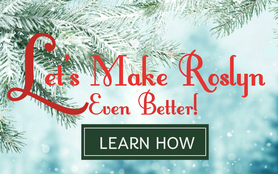 Visit MyRoslyn.org or click here to Learn More. DECEMBER 2015 • UPDATE: $30K ROSLYN SCHOOL YARD GRANT APPROVED • GREAT NEWS! The 2014-15 Roslyn School Yard Beautification Grant has been approved by the English Montreal School Board (EMSB) and the Provincial Government. $6,510 was raised during the Foundation's 2014 Holiday Donor Challenge to unlock the $30,000 grant that was approved. Thank You to all donors! Next Steps: Roslyn School has two years to implement improvements. Consultation sessions will be held with various Roslyn interest groups to help determine needed enhancements through the school yard. 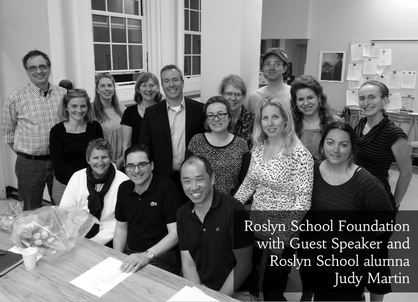 OCTOBER 2015 • 2015-16 BOARD OF DIRECTORS ELECTED • At the completion of Roslyn School Foundation's 2015 Annual General Meeting, three new Board members were elected. The new Directors are Christine Cardinal (former Roslyn Governing Board Chair), Kayla Elman (Director Sales, Marketing & Communications Segal Centre), and Kirk Kelly (former Roslyn Governing Board Chair, current Director Royal West Academy Foundation). Returning Directors are Paul Tsang, Liana Thibodeau, Jennifer Timmons, Irma Alvarez and founding member, Wanda Leah G. Trineer. View the complete list of 2015-16 members here. 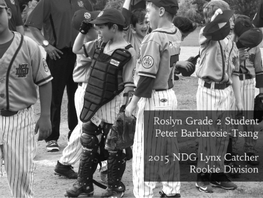 OCTOBER 2015 • ROSLYN STUDENT ON ALL-STAR BASEBALL TEAM • Roslyn School Grade 2 student Peter completed his first season as a member of NDG Minor Baseball Lynx (Rookie Division 7-8 years old). He was the second youngest player selected to represent the NDG Lynx (the league produced Toronto Blue Jays All-Star Catcher Russell Martin) at the 2015 Little League Provincial Championships where his team reached the Semi-Finals. Peter looks forward to Winter training which begins October 25th as he prepares to compete for a spot on the 2016 NDG Lynx team. 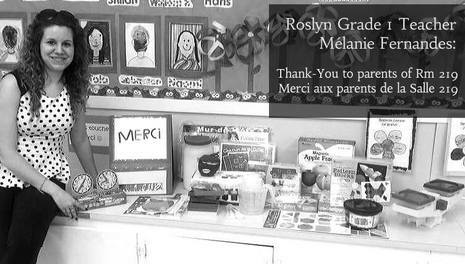 JUNE 2015 • ROSLYN PARENTS SUPPORT GRADE 1 CLASS WITH $900 DONATION • Teachers often supplement classroom material purchases as they are only allotted roughly $300 for their entire year's supply of materials for students. When Grade 1 parents of Room 219 heard their teacher Mélanie Fernandes was paying out of pocket, they proactively offered a donation through the Foundation to purchase additional classroom materials that would benefit all present and future Grade 1 students of Room 219 (total $700.00) in addition to gifts in kind (valued at over $200.00). Read the open letter from Mélanie Fernandes posted on the Foundation's Facebook page. 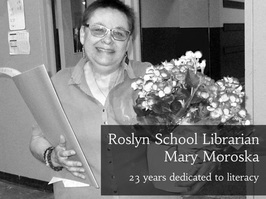 Librarian Mary Moroska will retire on June 30, 2015 after 23 years of unwavering commitment to the children of Roslyn School. As a farewell, on May 28 she read The Fantastic Flying Books of Mr. Morris Lessmore by William Joyce to the entire student body along with teachers, administrators, and library volunteers who had assembled in the gymnasium for the occasion. Read More. MAY 2015 • ROSLYN ALUMNA JUDY MARTIN VISITS FOUNDATION • The Roslyn School Foundation was pleased to welcome former Roslyn student and active community leader Judy Martin, Executive Director of the Hylcan Foundation and former President of the Board of Directors of Batshaw Youth and Family Centres, as guest speaker at its most recent board meeting. Judy addressed the Foundation's Board of Directors as well as key Roslyn School stakeholders during an evening of sharing best practices from her extensive experience in the non-profit sector. Read More. ​MAY 2015 • 2015 ROSLYN SPRING OPEN HOUSE • For an event that was almost cancelled and rained out the day of, the much anticipated 2015 edition of Roslyn School's Spring Open House presented by HandS and Roslyn Governing Board was hailed as a roaring success! 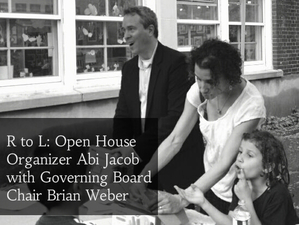 Everyone who attended the Open House on May 28th should know the event was made possible due to the commitment of two parents, Abi Jacob and Christine Cardinal who volunteered at the 11th hour to save the much loved event when no lead coordinator had stepped forward a week prior to the event. Abi wanted to express a "big big thank you to all for volunteering their time at the event. I met a lot of new parents who asked specifically for the Kindergarten rooms so I think it is an important event for new families." Co-coordinator Christine stated "everyone we approached [to volunteer] was happy and willing to help. Big kudos to Abi who showed up at her first HandS meeting and left volunteering to host it!" Despite the rain storm forcing the event to be moved indoors last minute, families appreciated the chance to enjoy Roslyn's amazing community atmosphere, catch up with friends and tour the school. 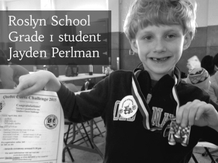 APRIL 2015 • ROSLYN STUDENT A CHESS WHIZ • Congratulations to Roslyn School Grade 1 student Jayden Perlman on his First Place finish at the April 12 Individual Chess Tournament (final opportunity to qualify) in the Grade 1 category. The Tournament was hosted by the Chess'n Math Association. Jayden has qualified for the 2015 Quebec Chess Challenge Tournament (Provincials) on April 26th. APRIL 2015 • UPDATE - SCHOOL YARD BEAUTIFICATION GRANT APPLICATION • As of April 15, 2015 the Foundation and Roslyn School Principal Nick Katalifos are awaiting the School Board and Provincial Government's decision on Roslyn's School Yard beautification grant application submitted in the Fall. Funds raised to support this initiative remain in the care of the Foundation. 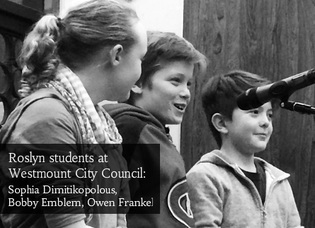 APRIL 2015 • ROSLYN STUDENTS AT WESTMOUNT CITY COUNCIL • Three Roslyn School grade 5 students spoke at the April 7th Westmount City Council meeting to follow-up on their petition for the creation of a beautiful and safe neighbourhood skate park. For students Bobby and Owen, it was their second meeting since their original November 3, 2014 presentation of the petition. Anyone interested in supporting the forward thinking initiative of these Grade 5 students can write to Westmount City Councillor Rosalind Davis (﻿rdavis@westmount.org﻿). MARCH 2015 • CONCORDIA STUDENTS PRESENT PR PLANS FOR 10TH ANNIVERSARY CELEBRATION • Roslyn School Foundation hosted Concordia University Communications students at Roslyn School library for a community event with students presenting their third year Communications course public relations plans for the Foundation's 10th Anniversary celebration. Great energy, enthusiasm and strategic thinking was on display by the seven groups. Read More. MARCH 2015 • ROSLYN TEACHER WINS VIDEO CHALLENGE AND $15,000 FOR SCHOOL • Congratulations to Roslyn School's Technology teacher Ms. Julie Marcus for submitting the winning Eastern region video to the 7th Annual MindShare Learning Digital Learning Video Challenge which is meant to inspire Canadian educators "to share their 21st century teaching practices, using technology infused pedagogy and how it played a vital role in engaging and motivating their students to support their success." Ms. Marcus will be awarded over $15,000CAD in a classroom technology prize package. ﻿Read more. FEBRUARY 2015 • 2014 TAX RECEIPTS ISSUED FOR DONATIONS • All 2014 tax receipts for donations received by cheque have been mailed. 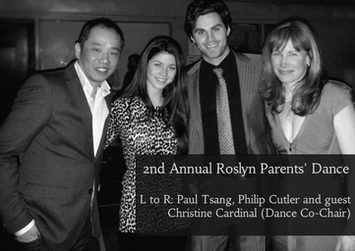 FEBRUARY 2015 • 2ND ANNUAL ROSLYN PARENTS' DANCE • The Foundation President and Secretary attended the event to support Roslyn HandS as they looked to raise money towards new school yard projects. Over 125 guests attended the Fire & Ice Ball which featured a silent auction, door prizes and complimentary hors d’oeuvres. HandS President, Aaron D. Fraser was seen behind the bar serving his signature "Ice" cocktail. Special guest and Roslyn School alumni, Philip A. Cutler, Westmount City Councilor - District 2, was on hand. JANUARY 2015 • 100% OF HOLIDAY MATCH DONATIONS UNLOCKED - MERCI À TOUS! THANK-YOU ALL! • Roslyn School Foundation's 2014-15 Holiday Donor Match Challenge was a wonderful success with $6,510.00CAD raised toward the Foundation's top priority this academic year, the Roslyn school yard beautification grant application. Read more. JANUARY 2015 • ROSLYN HOME AND SCHOOL ASSOC. TEAMS UP WITH THE FOUNDATION • Roslyn HandS has officially announced proceeds from the 2nd Annual HandS Parents' Dance Fire & Ice Ball to be held Saturday February 7, 2015 will be directed towards increasing funding of the 2014-15 Roslyn School Yard Beautification Grant Application. Total grant value, if approved by the Provincial government and the school board, is expected to be approximately $75,000CAD. DECEMBER 2014 • NEW WEB SITE OFFICIALLY LAUNCHED • With BETA testing complete, Roslyn School Foundation officially launches a new Web site. The Board of Directors extend their appreciation to Michael Krausse for his creative efforts developing the original site and diligently maintaining the Foundation's Web properties for the past 8 years. We are grateful for his tireless dedication and passion. FROM ALL OF US - THANK YOU, MICHAEL! NOVEMBER 2014 • FOUNDATION PLEDGES FUNDS TOWARD $30,000+ GRANT • Roslyn School Foundation has tentatively pledged $10,000 toward Roslyn School's 2014-15 School Yard Beautification Grant application (Measure 50530). If approved, Roslyn School will receive match funding from the English Montreal School Board (EMSB) and le Ministère de l'Éducation, du Loisir et du Sport (MELS) for a total grant valued at $30,000. NOVEMBER 2014 • 10TH ANNIVERSARY AROUND THE CORNER • The Foundation is looking forward to marking its 10th Anniversary during the 2015-16 school year. Planning is underway. NOVEMBER 2014 • THANK YOU COMMISSIONER GINETTE & WELCOME JULIEN • The Foundation extends its appreciation to outgoing EMSB Ward 3 Commissioner Ginette Sauvé-Frankel for her dedication to public schools such as Roslyn, since 2003. At the same time we extend a welcome to newly elected Ward 3 Commissioner Julien Feldman. 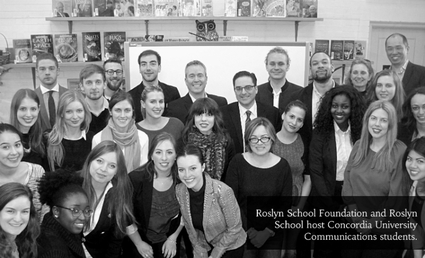 OCTOBER 2014 • 2014-15 BOARD OF DIRECTORS ELECTED • At the completion of Roslyn School Foundation's 2014 Annual General Meeting held on October 15, 2014, six new Board members were elected. The new Directors are Irma Alvarez, Mélanie Dinis-Fernandes, Randolph Jordan, Liana Thibodeau, Jennifer Timmons, and Paul Tsang. Returning Directors are Jason Lewis (2nd year) and founding member, Wanda Leah G. Trineer. 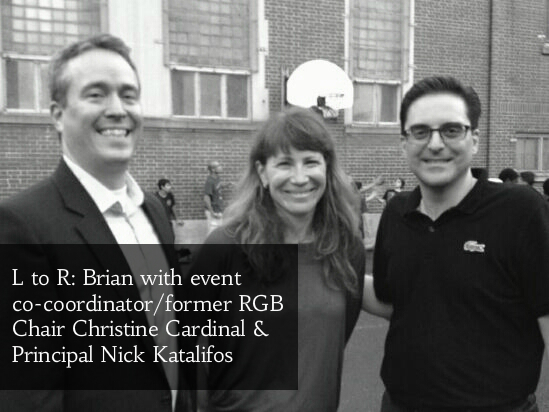 SEPTEMBER 2014 • FOUNDATION WELCOMES NEW ROSLYN PRINCIPAL NICK KATALIFOS • Principal Nick begins his first year at Roslyn School and joins Roslyn School Foundation as an Honorary Member. He spent the past six years as Principal of École Pierre de Coubertin Elementary School where he championed numerous initiatives, is a Director of Giant Steps Foundation and actively supports both civic and social causes. Welcome Nick!